What are the benefits of a wholesale hotel booking site? Wholesale Hotels Group - The BEST wholesale hotel booking site! First of all, a wholesale hotel booking site is not a reservation website, an online aggregator or an ordinary travel site that compiles and lists data from multiple sources. A wholesale hotel booking site is similar to a hotel wholesaler in the strictest sense of the definition. A wholesaler is an enterprise or an individual that procures hotels in bulk. The bulk purchase enables the enterprise or individual to get access to a substantial markdown on prices. The wholesaler can then leverage its financial strength to offer better prices to the end consumer or facilitators, which could include one or more sellers, resellers or retailers. Nobody pays rack rates anymore, you should not either! A wholesale hotel booking site would facilitate reservations at prices that are not available elsewhere. You may be aware that hotels have rack rates. These are the published rates, listed on the official website and found elsewhere online. These rack rates are standard tariffs that are applicable to walk-ins or anyone making an advance reservation unless a discount is available or offered in a specific situation. Most hotels do offer discounts to almost every guest. It is uncommon for people to pay rack rates these days since there are online sites where substantial discounts are available as a part of promotions that are run almost throughout the year. However, the rack rates are vital since they determine the discount and hence the eventual tariff that one must pay. The most significant benefit of using a wholesale hotel booking site is the deeply discounted rates you can access. This tariff would be unavailable if you go for the rack rate and then ask for a discount. It is also inaccessible if you go to aggregator websites, use coupons and find other ways to save money on a booking. Probably, you can get generous discounts if you were to reserve rooms in bulk or if you have some special rewards such as points to redeem. Yet, you would fall short of saving as much as you can using a wholesale hotel booking site. Seems like aggregator websites and ordinary travel sites come up with the same offers and hence same tariffs. Most of the time, you will end up in the same place. You may even end up paying rack rates if the hotel publishes the same as discounted tariffs. Then the aggregator websites source the information and list the prices as such. Using a wholesale hotel booking site like Wholesale Hotels Group would provide you a significant chance for you to find rates that are not available elsewhere. Your savings on these wholesale travel deals can be substantial and the best above it all is the price you need to pay to belong to that website. Our plans start from $4.99 for a 7-day membership. Bigger discounts on membership plans are provided on 3-6-12 month membership plans. SIGN UP NOW by clicking on the link below and use BLOG20 to get 20% OFF on your first membership for a limited time only (not valid on the 7-day plan)! 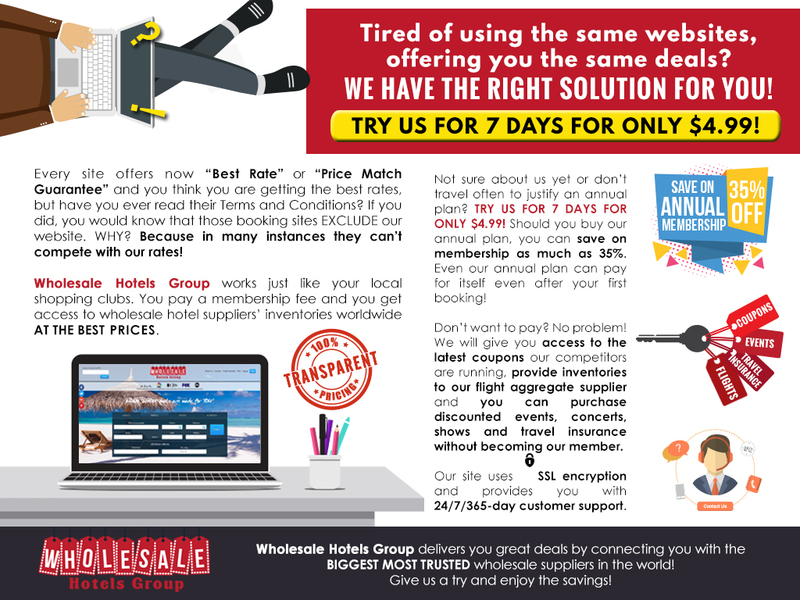 Wholesale Hotels Group – The BEST wholesale hotel booking site!